Mayor Pete Bass and Liba Furhman, a former mayor and chairwoman of the revitalization committee . NEW MILFORD — Flower pots are blooming downtown and will soon be accompanied by placards sharing the town’s history. They’re the first visible signs of the effort to reinvigorate downtown and connect it with the riverfront. Mayor Pete Bass is working with the Riverfront Revitalization Committee to create three walking loops through downtown as they look at long-term planning to attract people and businesses to the area. Last week, Bass and Furhman walked a mile-long loop, pointing out their vision for the area as they traveled from Town Hall, down Bank Street and Patriots Way to the completed section of the river trail by Young’s Field. There are plans for a downtown historical loop and an industrial loop. The goals of the loops are to offer recreational opportunities while promoting the town’s natural resources, such as the Housatonic River, and the proximity of shops and restaurants. All of these are selling points officials share when speaking with potential businesses. It’s still being decided how the trail loops will be marked. Bass said these loops will be posted on the town website along with the trail heads and boat launches. Another map for a mountain bike trail is in the works. He said officials are considering letting people rent bikes, much like they can rent kayaks at Young’s Field. “You’re going to have all of these activities you can do in New Milford,” he said. The walking loops come on the heels of the town receiving a $170,000 planning grant from the state to address brownfields. 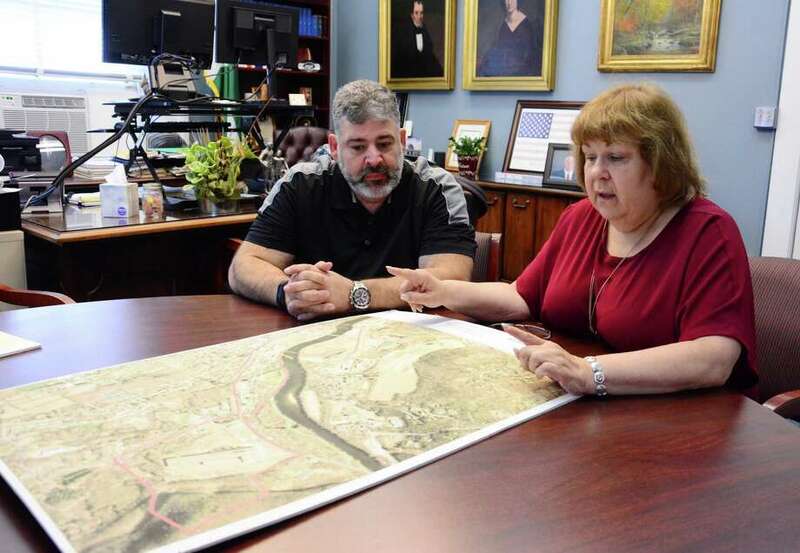 That money is being used to study the Housatonic River area from just below Bridge Street up to Century Brass, including Young’s Field, Public Works, Native Meadows Preserve and Helen Marx Park, as well as several brownfields properties. A brownfield is a former business or industrial site that usually has some environmental contamination. The study of the area is expected to take about a year and will coincide with a market study to gauge interest in various ideas for the site to ensure whatever is built will get economic support once it comes to town. The next phase will look at Century Brass to Boardman Bridge, and the last phase will extend from there to Lovers Leap. These phases are more aesthetic and linking pieces. In the meantime, Bass and the committee are looking to take care of the small, inexpensive changes to beautify and attract people to town. This includes adding plants, removing brush, painting polls, installing or moving signage, adding lighting and better directions. The directions can include physical directions with signs, as well as new paths that visually lead people to the river. Costs aren’t determined, but will be handled with grants, donations and some of the parks and recreation maintenance budgets. Furhman expects these improvements to be done by the new River Fest, which will take place Oct. 13. The free festival will include vendors, food trucks, a concert and beer garden. Railroad Street and Young’s Field Road are to be paved next month. As they walked along Patriots Way, Bass and Furhman pointed out brush that would be removed, locations for sidewalks, potential railroad crossings and possible murals on the backs of buildings lining the road. They also discussed screening the public works yard or even moving the department to another place in town to free up the riverfront space. “The bones are here,” Furhman said. Eventually they would like to add a path around the skate park to the stairs at Young’s Field, as well as stairs that lead to Veterans Bridge so people can get to the newly acquired Native Meadows Preserve across the river. “The whole key is to connect open space and recreational areas with other development,” Furhman said. They hope to schedule a volunteer day to help trim back the overgrowth along the river trail. Bass and Furhman credited the effort to the dozens of volunteers planning and helping out with the new plantings, as well as residents and businesses who have donated. “This project is really coalescing a lot of groups together and has the potential to be the catalyst for a lot of revitalization,” Furhman said.